I love a good lemonade recipe. Not just any lemonade, but homemade lemonade made from lemons, water, and sugar. It is the best! Yum! What is even better then homemade lemonade though is frozen homemade lemonade! Really! 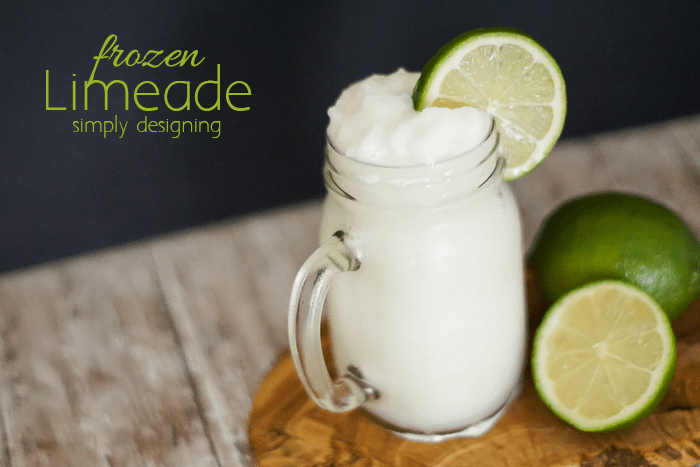 I made a Homemade Frozen Limeade the other day that is really tasty too! 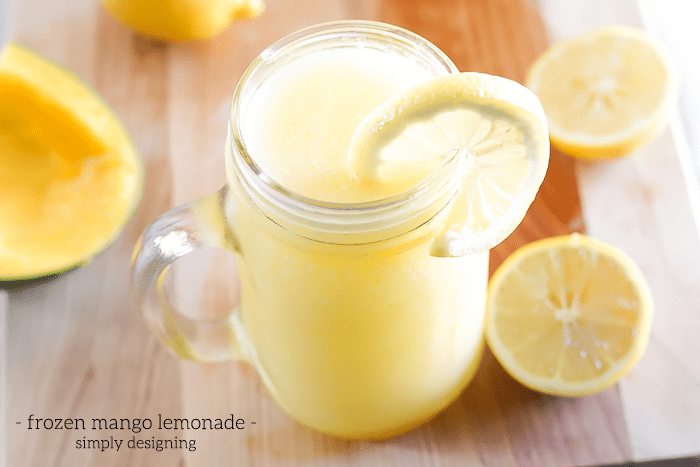 Any way you look at it, homemade lemonade is just amazing and perfect for hot summer days! So today I am sharing a really delicious Frozen Mango Lemonade Recipe that I know you will want to try asap! 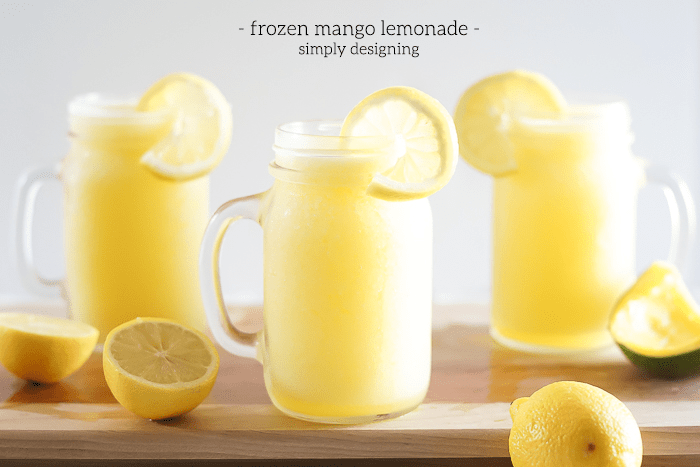 A big huge thank you to William-Sonoma for making this frozen mango lemonade recipe post possible. All opinions and ideas are mine. 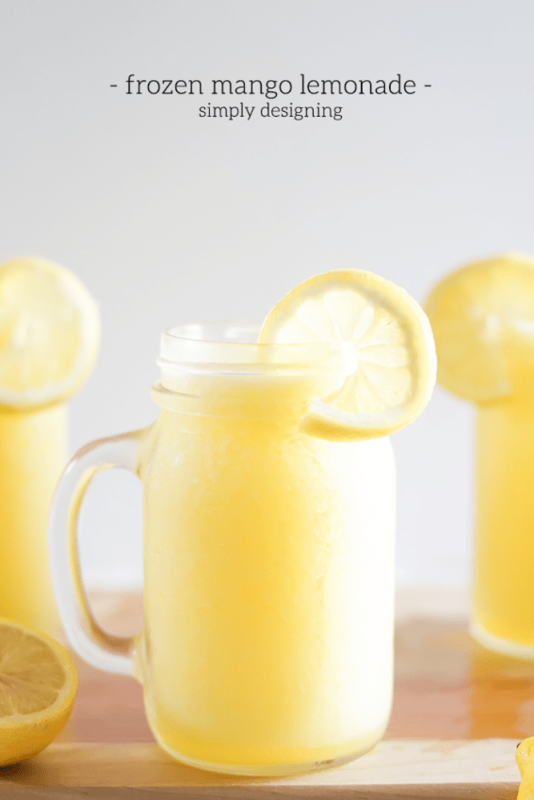 One of my favorite things about this lemonade recipe is the fact that it only takes 3 ingredients (plus ice and water) to make!! Seriously! 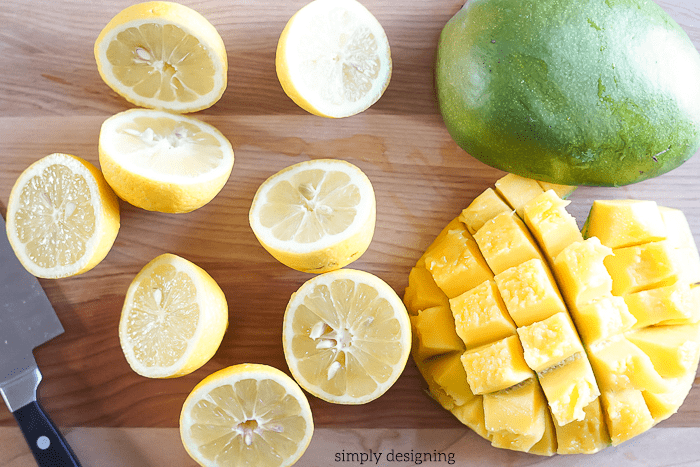 A few minutes of time juicing your own lemons and cutting up a mango is well worth it for this heavenly tasting fresh drink! 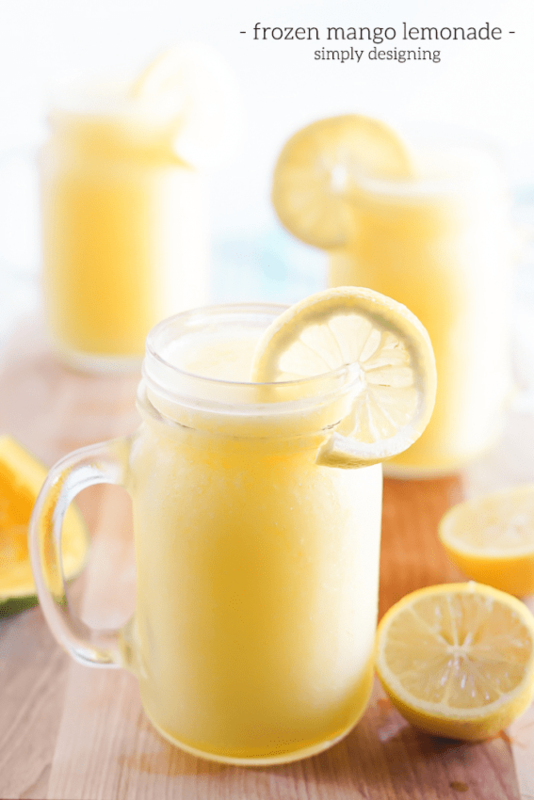 There is nothing in the whole world as good as homemade, fresh lemonade and the addition of mango to this frozen lemonade recipe is simply divine. 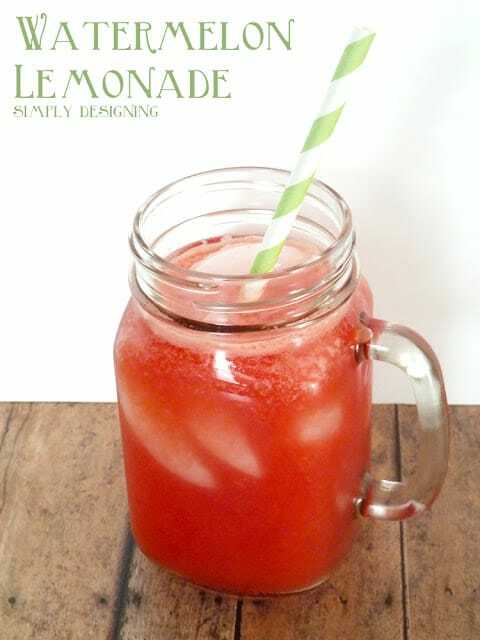 To get the most flavorful lemonade, you will want to begin with the best ingredients. Perfectly ripe lemons and mangos at the peak of sweetness ensure this lemonade is packed full of flavor. Look for lemons that are bright yellow in color. If it still has green coloring, it was picked too early and won’t yield the most juice. The skin should not have any wrinkles or brown spots. Make sure the lemon has no mold (white or green) on it. Typically, you will get more juice from lemons that have thinner skin and are smaller. Compare lemons and buy the ones that feel heavy for their size. Give the lemons a soft squeeze. If there is a little give, or the fruit feels a little soft, it will be a nice juicy lemon! Squeeze the mango gently; a ripe one should have a little give to it. Don’t pick one that is mushy. It should smell delicious at the stem end. If it smells like alcohol, it is over-ripe. The skin should be smooth and not wrinkled. The mango should be rounded like a football, not flat. Using a mango that is fully ripe ensures a sweet and flavorful drink without needing to add too much sugar to it. Fresh mangos are so delicious! There are several ways to cut a mango. Because this mango will be blended, how it looks is not super important, but getting the skin off without bruising the mango is. Here is an easy way to cut your mango. Cut your mango slightly off center, going around the pit. Then flip the mango and cut the mango again, going around the other side of the pit. 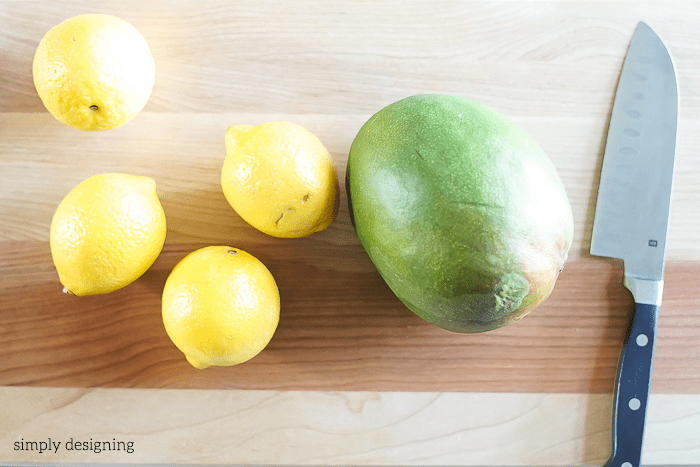 Make lengthwise and widthwise cuts through the mango but not into the skin, creating squares of fruit. Invert the mango so the square pieces of fruit stick up. Use a small knife or a spoon to remove the mango squares from the skin. 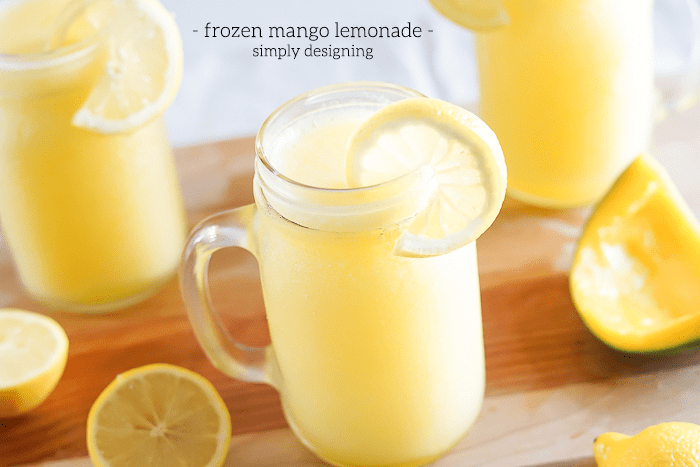 So here it is, my Frozen Mango Lemonade Recipe! Be sure to scroll to the bottom to snag the printable version of it if you prefer. 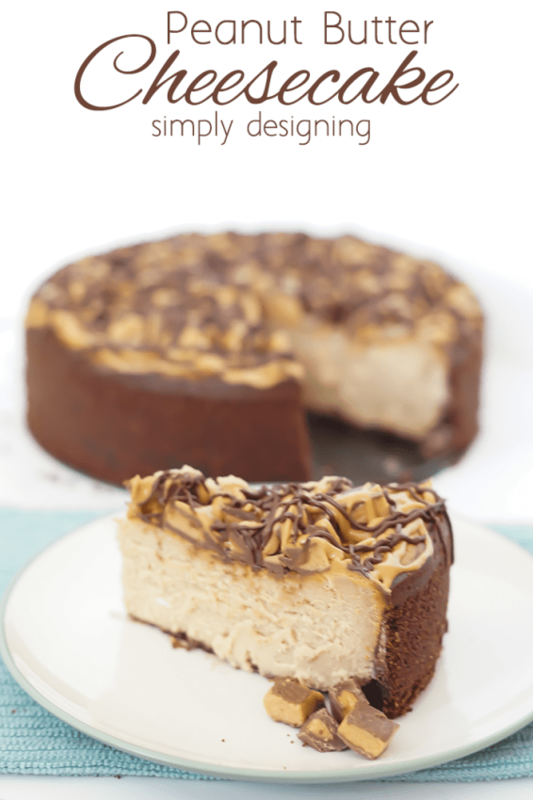 This is really not a difficult recipe to make and doesn’t even take too long! But it is the perfect amount of sweet, tart and fresh fruit taste! I love the taste of real lemonade and this frozen mango lemonade is amazing and perfectly refreshing for the summer! You may need to adjust the ingredients a bit for your taste. I like my lemonade a little more tart so you might prefer to add a bit more sugar or a little more water. And you will definitely want a nice blender in order to get a really smooth drink. I have a Vitamix blender and truly love it. It makes creating recipes like this one really simple and quick. Plus there are never any bits of fruit or ice when I use my Vitamix! My Vitamix is really my favorite blender ever! The Vitamix S55 from William-Sonoma is a perfect option for this recipe! The 20 oz blending container with a flip top lid would be perfect to create this drink on the go! (Although I would cut the recipe in half or a quarter because the above recipe truly does make a lot!) 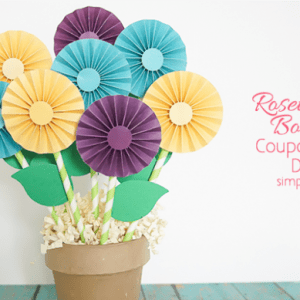 If you want to make the full recipe, the 40 oz blending container would be perfect! You will also need a blender to make this and a way to juice your lemons. 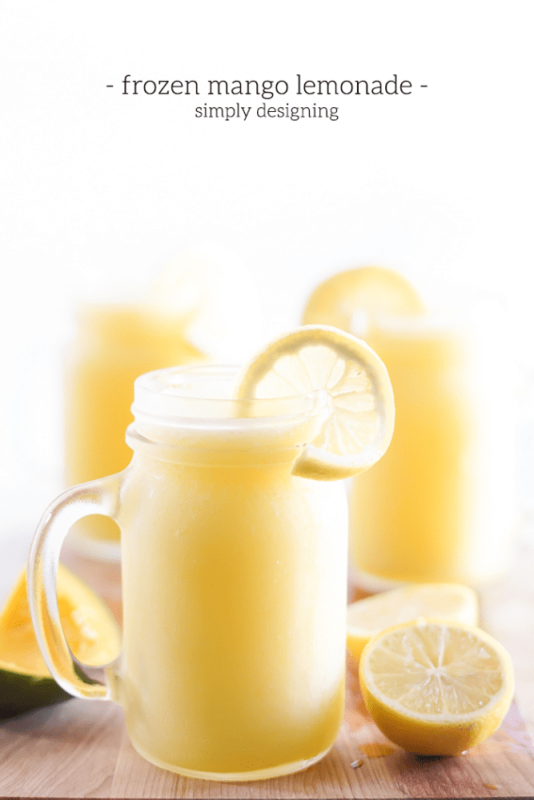 This frozen lemonade recipe with Mango is seriously amazing! Be sure to print it and pin it for later! We love trying new flavors of lemonade!! Adding this one to the list! mmmm, looks so refreshing! I have a new found love for mango, so I must try this! Woah, looks amazing, We are enjoying an especially good summer so far here in the UK (amazing, I know!) I’d love to give this a try this weekend. 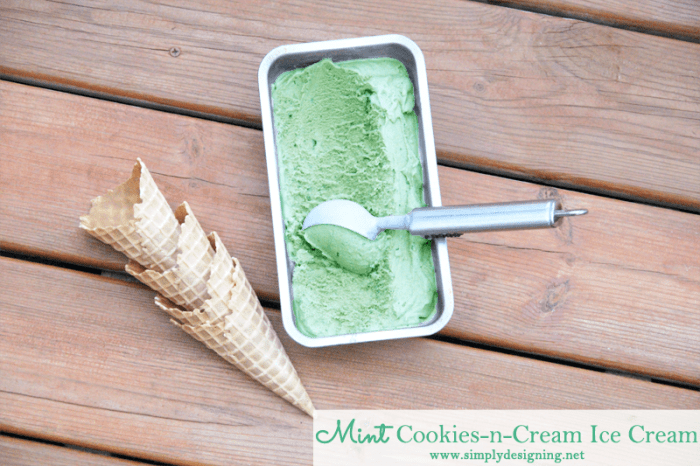 This looks so refreshing for a warm hot summer day! Mango is one of my favorite fruits. hello, this looks so delicious! I have the vitamix too, should i still juice the lemons? I would juice the lemons. You CAN throw the lemon into the vitamix, but having the peel in there will make it a bit more tart. I like the taste of it better when you just put the lemon juice into the mixture instead of the whole lemons.